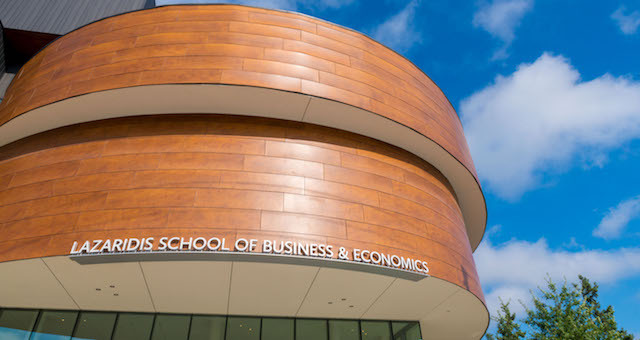 Waterloo – Wilfrid Laurier University’s Lazaridis Hall building, home to the Lazaridis School of Business and Economics and the Department of Mathematics, has been named the winner of a prestigious Civic Trust Award. The Civic Trust Awards, based in the United Kingdom, are Europe’s longest-standing awards focusing on the built environment. Lazaridis Hall, designed by Diamond Schmitt Architects, is the only Canadian building and one of only two in North America to receive a 2018 award. Award winners will honoured at a ceremony in March in Manchester, England. The 218,000-square-foot Lazaridis Hall held its grand opening in May 2017 and has been in use since September 2016. It has also won a number of other awards for its design and architecture. In November, Lazaridis Hall won the Interior Wood Design Award from WoodWORKS, a program of the Canadian Wood Council. 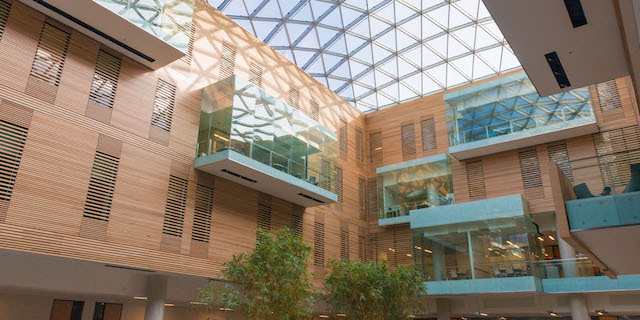 Lazaridis Hall features wood-lined spaces, including the building’s atrium, 1,000-seat auditorium and 300-seat lecture hall. Much of the built-in furniture also incorporates wood elements, including the continuous counters surrounding the atrium and a wall-mounted bench at the building’s entrance. In October, the building won a Canadian Consulting Engineering (CCE) Award of Excellence. The structural consulting firm, VanBoxmeer & Stranges Engineering Ltd., had major structural challenges to overcome, including building large cantilevered spaces, a drum-shaped feature with few opportunities for vertical support and a large skylight, which may be the largest single-layer trussless skylight in Ontario, according to Canadian Consulting Engineer Magazine. In April, Lazaridis Hall won an Award of Excellence from the Ontario Glass and Metal Association. Judges made special note of the “awe-inspiring curvilinear skylight” and the “transparency of the projecting glass-clad bays within the courtyard.” The building even won an award before its construction – an illustration prize for a watercolour of the original building design. Lazaridis Hall is targeted for Leadership in Energy and Environmental Design (LEED) Gold certification and is currently going through the final assessment process, which certifies buildings designed and built to high standards of sustainability in energy efficiency and environmental and human health. The building boasts high-efficiency boilers and chillers; an abundance of natural light; solar panels; measures to ensure indoor air quality; rainwater capture and use; green-roof areas; energy-efficient lighting systems; an electric vehicle charging station; and other green features. 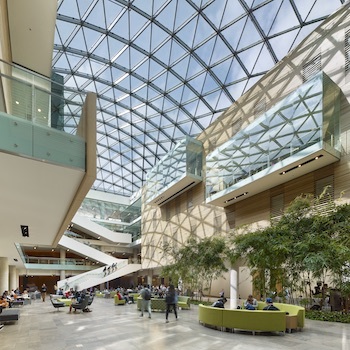 Lazaridis Hall cost $90 million to design, construct and furnish. The total project cost, which includes renovations to the nearby Peters Building, which formerly housed the Lazaridis School, is $103.7 million. The project was funded through grants from the Province of Ontario and the Government of Canada, as well as a fundraising campaign that included a substantial commitment from entrepreneur Mike Lazaridis. The independent Civic Trust Awards aim to encourage the very best in architecture and environmental design; improve the built environment through design, sustainability, inclusiveness and accessibility; and reward projects that offer a positive cultural, social, economic or environmental benefit to their local communities. Diamond Schmitt Architects is a leading full-service architectural firm based in Toronto with an international reputation for design excellence and sustainable design solutions. This is the third Civic Trust Award for Diamond Schmitt Architects, following wins in 2015 and 2016 for projects in Toronto.